With less than one week before my first public reading, I panic. Oh sure, I’ve read at writers workshops, but other writers expect flat expressionless words and concentrate on the print. I usually flub a few words, stumble along internally editing as I read and neglect any attention to how I sound. I’m a terrible reader, and now I’m subjecting an innocent and unsuspecting audience not only to my words but also my reading. My story of 1500 words takes almost fifteen minutes to read aloud. Ten minutes is the ideal length according to Randy Susan Meyer of the Huffington Post in “Ten Tips for Writers Reading in Public.” Now if I could channel my inner George Saunders, I might finish in five minutes. He races through the audio recordings of his stories in the Tenth of December. His reading pace creates “excitement” which is one of the goals for writers reading in public. Meyer recommends to either “entertain, enlighten, excite, engage” and always smile. From the four E’s, I decide to “engage” the audience. Eye contact is the key. And if I remember to smile, that’s an added bonus. I underline words and mark places for voice inflection. My story becomes a musical score with crescendos and decrescendos. I add a few staccatos and mark the tempo changes fast and slow. My biggest struggle is conveying changes in speakers – the ones without attribution tags. In print, a reader can see the carriage return to the next line. My solutions include moving a non-verbal action by the speaker to the beginning of the sentence, pausing before changing speakers, and varying the rate of speech for each character. I draw on what I learned at previous jobs. Big companies with hordes of human relations people — scheduling training every time you stand from your desk to fetch a cup of coffee — develop employees with twenty-first century skills, such as presenting and communicating. I benefit from years of presentations and public speaking classes. about your training programs. You made me a better person. I know how to stand and where to look. Practice eliminates little distractions, such as turning or flipping pages. My pages are in a leather binder to prevent my shaking hands from spoiling the illusion that I know what I’m doing. Writer’s Relief, “Open Mike Night: Ten Tips For Reading Your Writing In Public,” provides useful tips: arrive early, use a big font, and dress professionally. As a writer, however, I want to know how early, how big and what is considered a writer’s professional clothes. Will I have a podium to set my notes? Or will I stand alone behind a microphone? I choose slacks and heels and rock the “I just left the office thirty minutes ago” look. My preparation includes watching videos of accomplished writers at public readings. 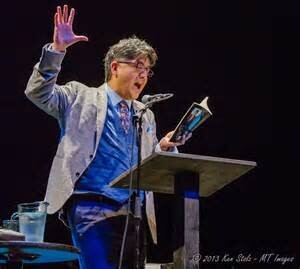 I’m fascinated by Sherman Alexie. Critics call him a stand-up comic. He writes. He jokes. He makes films. He entertains. Thanks to my pre-worries and research, my nervousness disappears when I begin reading. I make eye contact and people smile at me. At one point in the reading, I notice the room is silent and listening. This wonderful audience cares about my crazy made-up characters. They laugh at the right spots and respond with thunderous applause. Thank you, gracious audience. Then, I remember to smile. Standing in front of a group of adults to deliver a speech is daunting. Try standing in front of a group of teenagers in a class they have no interest in. Even more daunting. With reference to arriving early, I think one should arrive early enough to reach and endure boredom. After that, public reading, or even public lashes, should strike you as a more interesting activity. Finally, I shall make note of Meyer’s 4 e’s, and I want to add e5 through e7. The following e’s especially please me. They are exaggerate, exasperate, and enrage. These are often used. Exaggerate is bested evidenced in the not so old adage of “Dude, it was awesome!” Was it really awesome? Perhaps it was just hyperbole. “We are adrift in a sea of hyperbole.” But there is something exciting about massive quantities of anything. Exasperate is best accomplished when one breaks the subject matter into smaller and smaller pieces where even the best American mind cannot go hither. After losing them, one returns to pick them up and the audience is overjoyed because they have reconnected. Don’t wait too long to reconnect. Enrage by telling them what they do not want to hear. Then, go back and offset the entire tirade with a one sentence statement. Make it a quick thing, and don’t forget the histrionics. After reading all of this, you might think that I think that I know what I’m talking about, but I don’t. Thanks, Robert, your additional E’s would be a worthy writing experiment. The writer, Graham Moore, accomplished enrage with the harsh treatment of the protagonist in the award winning Imitation Games. Any nominees for exaggerate and exasperate? Congratulations, Karen. It must have been an honor to have been asked to share your writing at the author’s reception. I’m glad your nerves calmed down and the audience responded well. Thanks for all the tips! Thanks Kelly. I experience all the emotions before the actual events. Great information! Where did you do your reading? Thanks, Sue. 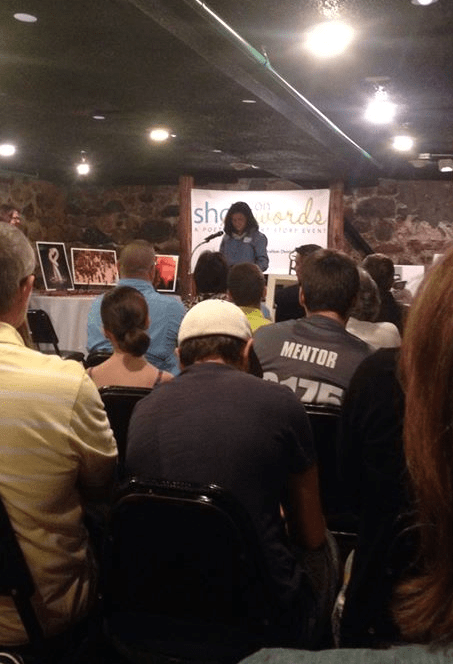 The judges of Short on Words asked four authors to read at the author’s reception. The youth division had four pieces read also. Very heartwarming experience. I enjoyed reading about it. Thanks Claire. It’s nice to have a happy ending.